From the cobbled street of old Rome where you can eat the best pizza on the terrace, to the narrow street of Antwerp in Belgium; from elegant Paris to avant garde Barcelona, a city sandwiched between the mountains and the sea, and where so many side streets empty into Las Ramblas, I have done and enjoyed visiting the backstreet of a few European cities. I do like the art galleries and the museums and the beaches and the hotels of any city, however what I enjoy the most is to sample the part of town where the real locals live or congregate. Sometimes, these areas are rundown, often times they are best described as unspoilt and dated, what they lack in aggressive modernity, they compensate for in blissful grace and laidback serenity. The people in these areas usually live a more normal life than those in the other parts of town almost like when you watch a period film. I once woke up in Barcelona (2003) to the cry of a man hawking calor gas on a large wooden trolley (omolanke), the like of which is rare even in Lagos. That day, I realised that some European countries are only marginally better than Nigeria. I even wept as I thought of what could happen in Nigeria. We only need to sort out electricity and a few other infrastructure and we will compete with Spain or Portugal. Enough of daydreaming, perhaps my love for these areas and the people is a quest for the beauty of what is ordinary. 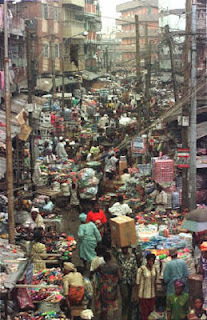 Now living in Lagos, each time I drove through some parts of Ebute Meta or Mushin, I had threatened to stop and take in the backstreets of what must have been an incredibly beautiful city in the past. I desperately wanted to experience the people, the old houses and hopefully sample the food which I’m sure will be really tasty. However it was either too hot or too busy with both vehicle and human traffic. Besides, I live in the city and there was no need pretending I was a tourist in a hurry to take in everything before departing for home. Still, I kept on fantasizing. Eventually the opportunity came on Saturday 5th March 2011. Coming from the extreme end of Lekki Pennisula, we drove past Palmgrove and Onipanu on Ikorodu discussing how we could get some potatoes when the person driving us suggested turning off the main road to the backstreet of Onipanu. I knew my time had come. The weather was fine, the service lane was sane and it has its own backstreet too. We parked at a comfortable part of the road and made our way to a narrow market with a sign announcing it as ‘Somolu Model Market.’ We saw, live chickens being sold from their cages; I saw a woman who only sold animal tongues and heads with grinning teeth. Some sold gari, potatoes and vegetables, all were calling us to have a look at their wares and buy. Eventually, we made our way to the end of the market into the service lane where some traders have taken possession of part of the road. We bought some potatoes and probably some vegetables. Although things are cheaper here than where we usually shop, it was the experience rather than the savings that mattered to us. I have done it eventually, done the backstreet of Lagos, the feeling was exhilarating, the people, warm as usual. I didn’t see a restaurant where we could have a sit down meal like I would do in Europe. Who cares, there is Yellow Chilli in Victoria Island. My wife loved it, we got back into the car and headed home with a real sense of achievement. I was especially taken with this post that presents a candid perspective of what happens on the lesser seen inside of our aspiring megacity. By way of interest, I got the URL to your blog via a post on a discussion forum which had "Travel to Nigeria" as a hot topic. It's great to know we have people like you writing intelligently to share a balanced insider perspective about this country. I hope you keep this blog going. It's likely to gain a larger following over time.